The Minutor Pack Builder lets you build custom definitions for blocks, biomes, and dimensions. A collection of definitions is called a mod, and a collection of mods are called a pack. In this tutorial, we'll show you how to create a quick addition, a mod, and a pack. I have made available several "pre-made" packs. These contain definitions for widely used mod packs like the Feed The Beast Direwolf20 pack. Since you can manually change the block ids for many mods in the pack, your installation could be unique. To compensate for this, these packs will use your forge configuration. You'll find out more about how this works in the Building a Forge Mod section. This drop area is asking for your forge configuration file. It will use your configuration files to generate a pack customized to your installation. Navigate to your minecraft folder. For example, if you are using the Direwolf20 pack and you installed it into a folder called ftb on your desktop, then you'll want to navigate to Desktop/ftb/Direwolf20/minecraft. As soon as you drop the folder, your browser will download a zip file that contains the configured pack. You can now import this zip file into Minutor. Now let's look at making a quick addition. Let's say that a new minecraft snapshot is out, and it adds 3 new blocks. The first is block ID 200, and called Awesome Block. The next is ID 200:1, which is Super Awesome Block. The name of the mod. You can call this whatever you'd like. The version of the definition. You can use anything you wish here. Using the snapshot version is a good idea. This is the relative file path to the forge configuration. Leave this blank for now, we'll use it later in Building a Forge Mod. This is the update URL. If you intend to distribute this definition, you can use this field to tell Minutor where to check for updated versions of this definition. Again, leave this blank for now. Now click on [Add Block] to add a block to this definition. This is the ID for the block, which we are pretending is "200". For Forge mods, this would be a variable name instead of a number. We'll get to that later. This is the name of the block. What Minutor displays when you hover over the block on the map. This is the color of the block. Click on the color swatch to change it using the nifty color picker. This is the transparency of the block. 100 is fully opaque, 0 is fully transparent. These flags are used by the spawn-detection code. Setting these incorrectly will misidentify spawnable areas. This means the block can be "seen through". This could mean a lot of things. 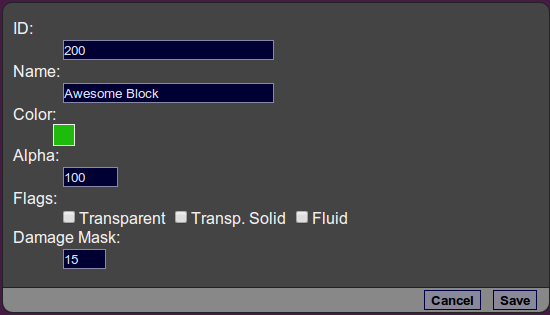 A block is considered transparent not only if the textures are translucent, but also if the block fails to fill its entire block space. Ice, torches, beds, cactus, doors, flowers are all considered transparent. This means that not only is a block transparent (which means you should always check Transparent in addition to checking this), but that the block is also solid. A block is considered solid when the player is affected by its hitbox. So torches or levers aren't considered solid, but chests are. There are couple of strange exceptions however. Enchantment tables are not considered solid. Anything considered a liquid should have this checked. Lava, water, oil, etc. This is the bitmask used before checking for variants. For the most part, you will leave this at 15. Let's look at an example. Logs (block #17) use the damage value to determine both wood type (oak, birch, etc) as well as log orientation. Since we don't care about orientation, we'll use the Damage Mask to mask out just the two bits that determine wood type. So this would be 3 for logs. Next we'll look at adding the Super Awesome Block. Recall that it had ID 200:1. The colon means that this block is the same as the Awesome Block except it has a damage value of 1. We represent this by saying it is a variant of 200. In the block list, you should now see [Add Variant] under the Awesome Block. Click that to add a variant. This is the damage value of this variant. Remember, this is the value after the Damage Mask has been applied. This is the name of the variant. It defaults to being the same as the parent. If you leave this the same as the parent, or blank, it will always be the same as its parent. This is the color of the variant. It also defaults to being the same as the parent. If you leave this unchanged, it will always be the same as its parent. This means if you change the parent's color, this variant's color will change as well. on this page to save all your changes to the mod. At this point you might be wondering where these things are actually saving to. You'll notice you can reload the page and your mod is still listed. These mods are saved to your browser's Local Storage. This means these changes will only be visible to you, using this specific browser. If you wish to view and modify this mod on other browsers, or send to other people, you'll want to export this mod.
. It should download a json document. This json document can then be imported into Minutor, and doing so will add support for the Awesome Block and Super Awesome Block. Since this file is in standard JSON format, you can also modify it using a text editor if you wish.
. This will delete the mod, but won't affect the file you exported earlier. , and you'll notice that below the Name field there is an area for dropping exported mods. Just drag your exported mod onto that box and drop it. This will import the mod, and you can edit it and re-export it if you wish. Creating a new forge mod definition from scratch is a lot of work, so to get your feet wet, we'll instead just extend an existing forge mod definition. This is something you might do anyway. 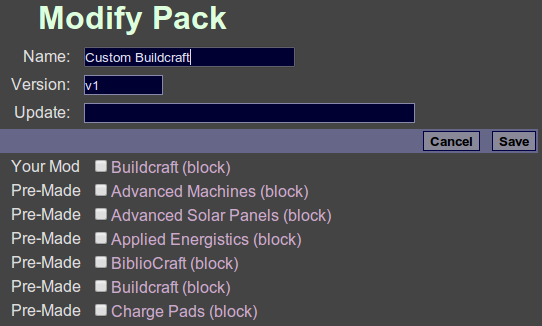 and select Copy Buildcraft (block) from the dropdown. What this does is take the pre-made buildcraft definitions and copy them into your new mod. Name it whatever you like. Now we'll modify it. You'll notice the Configs field has buildcraft/main.conf. This is the path to the buildcraft forge configuration file, relative to the main config folder. This is actually a comma-separated list of config files, since a mod may have more than one. Go ahead and track down main.conf on disk and open it in a text editor. You should see all sorts of configuration options. the block IDs listed. What we want is the variable name for our new block. This is the full variable name for the block, which includes all section names, plus the variable, minus the variable type. For example, the Architect Table's id is block.architect.id since it is in the block section, its type is I: so we ignore that, and the variable name is the everything after the type. So, let's imagine that this fictional Buildcraft version has added a new block id. Let's imagine you see I:magicbox.id=666 in the config file, inside the block section with all the other blocks. You open NEI in game and see that 666 belongs to a new block called Wish-Granting Box. So, what we do is simply scroll to the bottom and click [Add Block]. 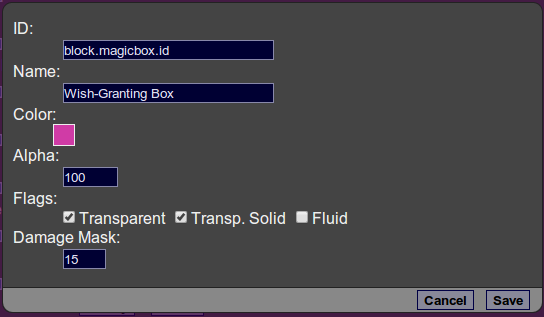 You'll notice we put its forge variable name block.magicbox.id instead of 666. While 666 will work, if the config ever changes, updating our definitions file will be harder. While we were checking this box out in NEI, we also noticed that it was pink, and even though it didn't take up a full block, we could stand on it. Therefore it was Transparent + Transp. Solid. We leave damage mask at 15, because it doesn't have any variants. the mod with the forge configuration. But you'll notice there is no generate button for mods. In order to use this updated Buildcraft we'll want to make a custom pack. If we want to Generate using forge variables, we'll want to create a custom pack. The name of the pack. This is up to you. Again, this is up to you. However, if you are modelling a pack after a mod pack like Direwolf20, you'll want to make the version numbers match. Just like in the mod editor, this is the URL for the final zip if you wish Minutor to automatically pull updated versions of the pack. Leave this blank if you don't want that. It should be noted that Minutor will not update individual mods of a pack. In a pack, only this update URL matters, and the individual mod URLs will be stripped out. Finally there's the list of all the mods available. Your mods will always be listed first, followed by any pre-made mods. Go ahead and check in your custom Buildcraft mod. You could check as many mods as you want in the pack. Since Minutor can load multiple definitions at once, we can make this one just override Buildcraft, the other packs will supply the other mods. Minutor checks your pack and sees that you are using Forge Configuration variables. It now prompts you to drop your forge configuration folder onto the page. You learned how to do this with the pre-made packs, so go ahead and do it. It should then download a zip file with your custom pack. You can import this into Minutor, and your customized buildcraft pack will start working. You now should have a grasp on how to do anything you need.. from making overrides that make diamonds stand out, to full packs that can be customized to your forge configuration.